Conflict with Kurdistan and Baghdad: The solution begins in Baghdad. We have tried everything possible with the central government, and nothing has worked. A separation is the only option remaining. As it was drawn from the ruins of the Ottoman Empire, Iraq is a conceptual failure, compelling peoples with little in common to share an uncertain future. It is time to acknowledge that the experiment has not worked. Iraq is a failed state, and our continued presence within it condemns us all to unending conflict and enmity. Turmoil surrounds us. In the summer of 2014, the face of the nation was exposed when the Islamic State terrorist group seized a third of the country and a significant part of the border with Syria because the most credible institution in the land, the Iraqi army, failed to defend it. Eleven years after the tyranny of Saddam Hussein ended, Iraq was exposed for what it is: a country that cannot protect its people and can barely define its interests. Compulsory coexistence has not worked. And that is why the Kurdistan region of Iraq will hold a referendum to establish a sovereign state, which would formalize a divorce from Baghdad and secure the area we now control as a homeland for the Kurdish people. This move will not only offer hope to the Kurds; it will also bring certainty to a divided region. Since the fall of Hussein, we have proved ourselves to be reliable allies to many of our neighbors. We are a bedrock in the fight against the Islamic State, hosting militaries from at least a dozen nations and making tremendous sacrifices to liberate Arab territories from the juggernaut that imperils us all. We stand near the gates of Mosul, willing to play a substantial role in ousting the Islamic State from Iraq’s second-largest city. We have opened our gates to hundreds of thousands of refugees over the past two years, as well as during the darkest days of the sectarian war that earlier ravaged the center and south. The Kurdistan region is now home to a large, thriving Christian community whose members fled Mosul and Baghdad for a haven the central government could not provide. In short, we have pulled our weight. We have tried to be inclusive. We have been patient. But economic agreements that had guaranteed us revenue streams have been repeatedly dishonored and now sit discarded. Under successive agreements, we have had duties as a component of the Iraqi state, but they have never translated into rights. Whoever has held the seat of power in Baghdad has reneged on promises and ignored obligations, many of them constitutional. Even if a leader emerged who was better disposed toward us, his goodwill could never overcome a system geared toward siphoning away our rights. We are subjects, not citizens. There is simply no trust between us and the central government. The relationship is irreconcilable. The solution begins in Baghdad. We have tried everything possible with the central government, and nothing has worked. A separation is the only option remaining. We want to move ahead with a vote on independence, but we must first work with Baghdad to pave the way for an amicable split that secures our mutual interests. That process has begun. We have broad support among the various Kurdish factions. We will also hold talks with Turkey and Iran to explain that this move will not destabilize their borders. We strongly believe that this effort will serve as a reset for the region, as much for our friends as for us. We have all done enough pretending — to our peril. An Iraq free from the shackles of what Baghdad describes as the “Kurdish issue” would be liberating for both sides, disentangling interdependencies that each of us resent and allowing us to secure our economic footing. Beyond that, though, an independent Kurdistan, with access to the weapons we need to defend ourselves, would secure the interests of our allies and the people of the region. Our relationship with Baghdad has crippled us in this fight. We have no access to battle-changing weapons, which must be funneled through the central government. Independence would allow us to secure long-term loans and bonds in the international market and export oil and gas at competitive prices to alleviate our financial difficulties. To remain invested in a state that has clearly and repeatedly failed is folly. It is past time to recognize that. With little else but the dedication of its people, the Kurdistan region has already built the foundations of a successful, prosperous state. We have earned the right to self-determination and have shown that, even without statehood, we are a valued component of the international community, the most steadfast of allies in a region short on certainty. We stand ready to join the community of nations. 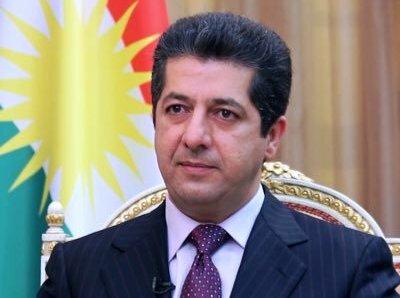 (*)Masrour Barzani is the chancellor of the Kurdistan Region Security Council.